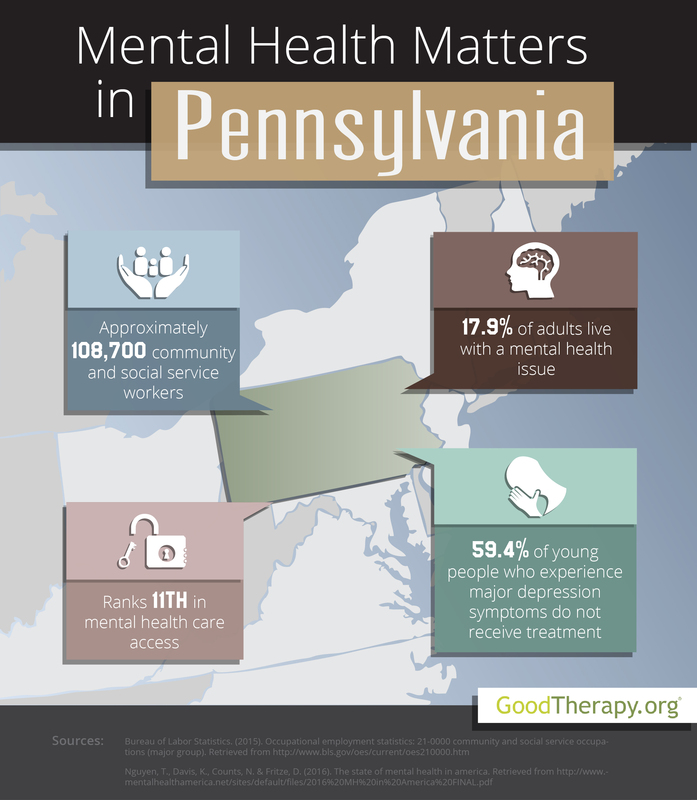 Find a therapist in Pennsylvania with GoodTherapy.org. Pennsylvania had roughly 12.8 million people living in the state in 2015. Census data shows approximately 82.6% of Pennsylvania residents are white, 11.7% are black, 6.8% are Hispanic or Latino, and 3.4% are Asian. Elderly residents who are 65 or older make up 17% of the population, while minors make up 21%. Roughly 51.1% of the population is female. There are about 108,700 residents who are employed in jobs specializing in health care or social service. After completing its annual survey on mental health conditions across all U.S. states in 2016, Mental Health America (MHA) gave Pennsylvania was ranked overall 14th. The states were also evaluated in specific health care measures, with Pennsylvania finishing 14th in youth ranking, 8th in adult ranking, 17th in prevalence of substance abuse and mental health issues, and 11th in access to mental health care. Therapists in Pennsylvania and MHA researchers believe this high access to care ranking correlates with high rates of graduation for high school students with disabilities. There are therapists in Pennsylvania who believe substance abuse issues and clinical depression are major concerns for adolescents in the state. The Substance Abuse and Mental Health Services Administration (SAMHSA) claims in 2012-2013, 7.6% of teenagers in Pennsylvania report cigarette use—higher than the national average of 6.1%. During the same time period, 17% of Pennsylvania residents below the legal drinking age report engaging in binge drinking compared to 14.7% in the country as a whole. In the 2016 MHA survey, Pennsylvania was ranked 25th for young people who abuse or are dependent on illicit drugs or alcohol. The state was also ranked 23rd for young people who experienced at least one episode of clinical depression in the past year, and 27th for adolescents with severe major depression symptoms. The 2016 MHA report estimates 1.76 million adults in Pennsylvania experience mental and behavioral issues. For example, 839,000 residents either abuse or are dependent on alcohol or illegal drugs, and 385,000 adults experience intense suicidal ideation. Of the total population of adult residents with mental health issues, roughly 897,000 individuals did not receive professional care. Approximately 339,000 adults who actively sought treatment report they did not receive all the care they needed, while 389,438 adults with disabilities could not seek treatment due to financial barriers. According to Mental Health America, 220,000 adult residents with adverse issues are currently uninsured.